Rescue Stormcloak soldiers from the Imperials and capture the fort. Meet the Stormcloak rescue party. Sneak in the cave or fight your way in through the front gate. Eliminate the rest of the Imperials. After reporting to Galmar Stone-Fist in the Falkreath Stormcloak Camp, he tells you that your current objective is the Imperial-controlled Fort Neugrad where some of your brother Stormcloaks are being held captive. He has sent scouts ahead to the fort, so meet up with them for further instructions. When you meet up with the scouts speak with Ralof, who will be quite happy to see you. He will tell you that they have located a cave under the lake that should lead into the fort's prison. He will ask you to sneak in, kill any Imperials you find, and then release the Stormcloak prisoners. After you have released the prisoners, head to the courtyard where he and his men will join you in fighting the Imperials. Follow the quest marker around the fort to the lake. Be careful not to get spotted by any Imperials or you will fail that objective and have to storm the fort. Once in the lake, swim down and you will see a small wrecked boat with a locked chest slightly hidden under it. Directly behind you is the entrance to the cave. The passage at the bottom of the lake will lead into the prison level of the fort, through the natural cave at the southeastern corner. Eliminate the Imperial soldiers in the prison room and get a Fort Neugrad prison key from them (there should also be one lying on top of a chest in the same room). Open the cells and the Stormcloak soldiers will run to a chest to acquire weapons and armor. Talk to one of them and he will ask you what to do: you can tell them to wait where they are, or follow you. To guarantee they all survive, you may instruct them to stay behind, and return to them after the fort has been taken over. If you tell them to follow you, they will participate in the upcoming battle and may die, although this doesn't seem to have an impact on the quest. As you leave the Fort Prison level and reach the courtyard, you will engage more Imperial Soldiers. Ralof's band will join the fray once you start the fight. After the fight, you will have to go inside the fort to eliminate the rest of the garrison. You can have Ralof follow you, or tell him to wait out in the yard. Once the Imperials and the fort commander are dead, talk to Ralof and he says that he will stay and clean up the mess. That ends the quest and starts the next stage in Liberation of Skyrim. If you kill the prisoners, that part of the quest will fail, but Ralof and his men will still join you for the battle in the courtyard. Openly entering the fort with a follower or two and letting them defeat all of the Imperial soldiers may be a useful way to avoid many, if not all, of the myriad bugs that can occur with this quest. Completing this quest deposes Siddgeir as Jarl of Falkreath, and installs Dengeir of Stuhn in that position. Siddgeir will move to the Blue Palace. Dengeir has two personal favor quests which cannot be started if he is Jarl. If you have Serana as a follower during the assault, she will often reanimate Imperial soldiers that have already been killed, who must then be killed again to complete the quest. This quest may actually go to stage 255 to be finished. ? Sometimes, instead of Imperial soldiers, you will find bandits holding the Stormcloak prisoners. The prisoners will still speak the usual dialogue lines ("The guard has the key.") but there are neither any guards nor a key, and the prisoners may even be unresponsive once freed, hence ruining the Stormcloak questline. This bug may also happen even if the Imperial soldiers are there, but you fail to sneak into the fort. ? Reload a save from before the quest was received, completely clear out the fort of all bandits, and then receive the quest from Galmar Stone-Fist. Reloading a save from after the quest is received will not fix this bug. You may not be able to initiate a chain of events for the mission. ? Using the console command movetoqt CWMission04 will teleport you into the cell of a prisoner you are supposed to rescue. Getting out of the cell will require picking the lock. Stormcloak soldiers may appear inside or near the fort as you approach. As fighting starts out right away, you fail the "Sneak into the fort" objective. To solve this, use the console command tcai and tai to turn off the combat AI and the AI globally, sneak past the fort and enter the cave. Then when loaded inside, turn both back on again. After freeing the prisoners, you may not be able to activate Ralof's dialogue menu. This is a problem because the task that follows freeing the prisoners entails speaking with Ralof and therefore becomes impossible. One possible solution is to transform into a werewolf away from the soldiers surrounding Ralof, and then kill all of the soldiers. Once that is done, Ralof himself will ask you to get him another garrison of troops. After you retrieve his soldiers, you should be able to continue the dialogue. Alternatively, kill all the troops and then use Voice of the Emperor (if your race is Imperial). Another possible solution is opening the console and entering setstage CWMission04 20 if the prisoners lived or setstage CWMission04 21 if the prisoners died. Although you have killed all of the Imperials occupying the fort and freed the Stormcloak prisoners, the Stormcloaks may keep saying that there are Imperials around somewhere. 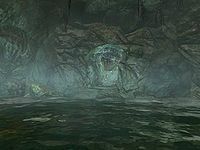 Although you have already infiltrated the Neugrad prison through the cave in the lake, the "Sneak into the fort" objective will still not be completed and will display two exits to work toward on the compass. ? To complete the objective, order the freed Stormcloak prisoners to wait in the prison, then climb up the ladder exit to Skyrim and reenter the prison from the same exit. If you approach the fort directly via the road, even if you're sneaking and completely invisible at night, you will still fail the "sneak into the fort" objective before the fort even comes into view. Mod Notes: This is due to a scripting error that causes the objective to fail even if you're not spotted. You may fail the objective "Sneak into the fort" even if you approach the cave completely undetected at night, even if not taking the main road. You may also fail the objective if you speak to Galmar too close to the fort. To fix this, move away from the fort and use the console comands prid 0001B133 and moveto player to move Galmar close to you and away from the fort. Talk to him and initiate the quest. If you plan to sneak into the fort, use the command setobjectivecompleted cwmission04 12 1 to complete this objective and proceed with the quest. Ralof may not be near Fort Neugrad and may be stuck in Helgen trying to get out of the gate. Opening the gate and speaking with him will initiate the next stage of the quest, at which point he may run off to the Stormcloak camp near Whiterun. Before approaching the Fort make a Quicksave as you may get the "Failed: Sneak into the Fort" message. If so, reload the save and see the above mentioned resolution to fix. After taking over the Fort and getting the "Report back to Ralof" message you will need to fast travel to the Whiterun Stormcloak camp to find him. If he does not advance the quest when talking to him then open the console and enter setobjectivecompleted CWMission04 50 1 followed by setstage CWMission04 100. Galmar Stone-Fist has sent me to Fort Neugrad. I am to meet up with some scouts who will help me break into the fort's prison. I will then break out some fellow Stormcloaks held captive there and take over the fort. 200 Finishes quest We have rescued the prisoners and taken over Fort Neugrad. This page was last modified on 5 January 2019, at 22:22.